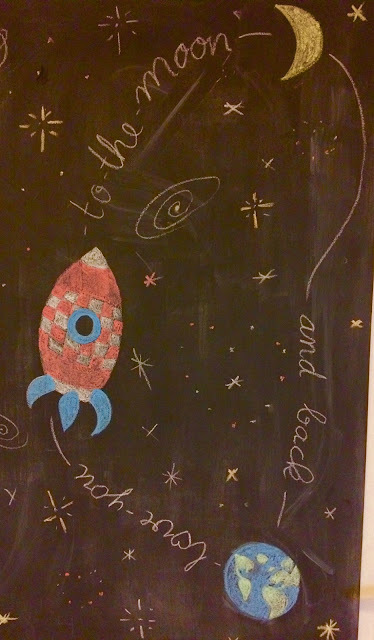 In my family we all have an interest in space science and astronomy, so I thought it would be nice to use this in a Valentine's drawing on the chalkboard we have in our kitchen. My daughters, 7 and 9 years old, both want to be an astronaut when they're grown up. My youngest has an alternative though. When becoming an astronaut turns out to be too ambitious, she wants to own a little exotic fruit shop, that she will name 'The Fruit Queen'. Astronaut vs Fruit Queen. Almost the same. I so love this! 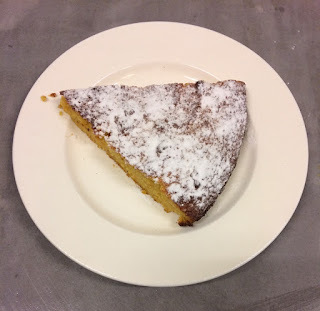 Last week I told you about the left over of almond meal I found in my pantry and the Orange Almond Cake I wanted to make with it. So here it is! Because I didn't have enough almond meal I just cut all ingredients in half (1 orange instead of 2, 150 grams of almond meal etc), but the cake came out perfect anyway. The cake was delicious and made me totally think of Spain and all their great dishes! So, I bought more almond meal and promise you to use it before it's overdue this time. Simple and easy, fast and quick. All you need is a pen to use on china and a white mug. 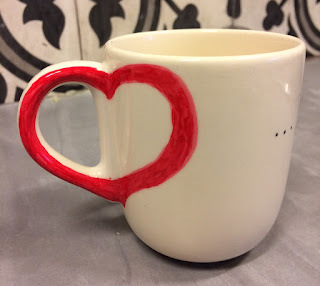 Use the handle to make one side of the heart and draw the other half on the mug. Part two of my daughter's birthday has taken place this week: treating to her class mates. At first she wanted me to make angler fish cupcakes, of course, but after seeing emoji cupcakes somewhere, she immediately changed her mind. And she also knew exactly what she would wear on the big day: her emoji T-shirt, which can change from happy to sad by brushing the paillettes the emoji is made of, together with her what she calls her posh jacket. 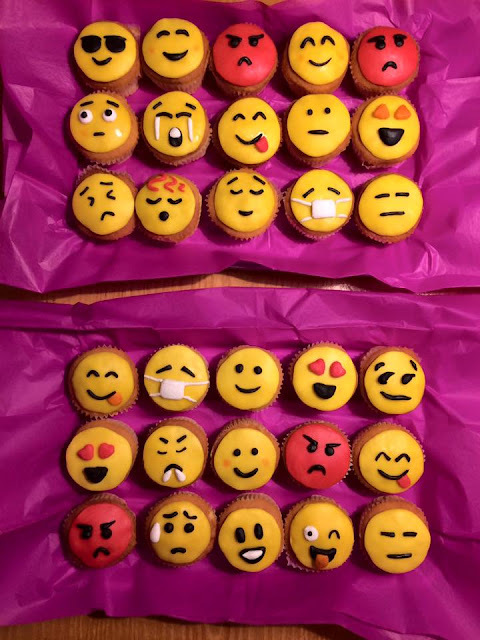 After the last birthday I had the intention not to put so much time and effort in the school birthday treats anymore and the emoji cupcakes didn't seem to take too much of both, but again I found myself being busy in my kitchen for hours. But, the result is nice! Pikachu, from the Pokemon game, was featured by Creative Jewish Mom. 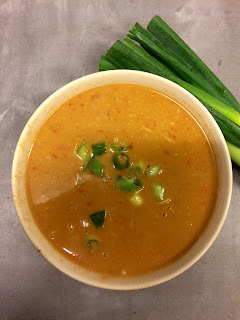 My Thai Peanut Soup was featured by Scrapality! I added a tail and fins and the angler's fish main feature: a little light at the end of its angler. I used a little yellow glass bead for this. Once a month I go through my pantry to see which food is overdue. Most of it I throw in the garbage bin, but some things are still good enough to use. Then I go over to Pinterest to look for recipes with that particular ingredient in it. On Pinterest I saw this heart pendant that was sold by an Etsy store once. 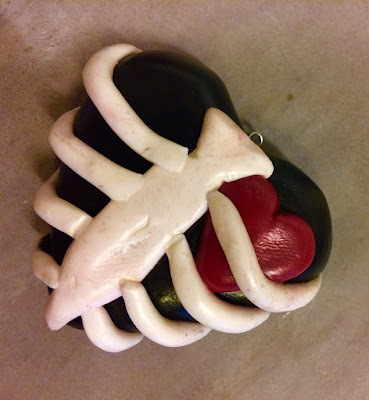 The Etsy Store seemed empty and unused now, but I really liked the heart and because I had some polymer clay left overs from other projects, I gave it a try myself. Just altered it a bit (making the breastbone more looking like a breastbone and I placed the heart behind the ribcage) and now I have my very own pendant. After making Weedle last week for my oldest daughter I had to make Pikachu for my youngest this week. 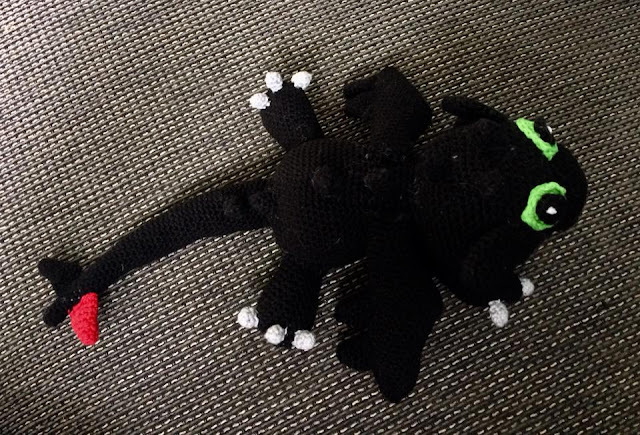 No idea what or who these creatures are, I just make what my daughters asked me to make. Of course I know they're from a Japanese game, but that's about it. 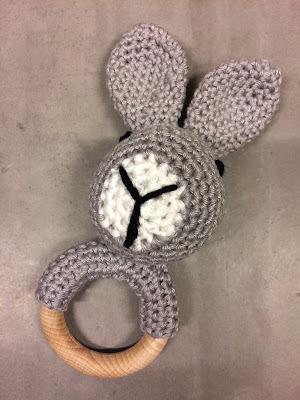 My Rabbit Rattler was featured by Scrapality, Nifty Thrifty Things and Architecture of a Mom this week! Thanks, Andrea, Vanessa and Rachel! 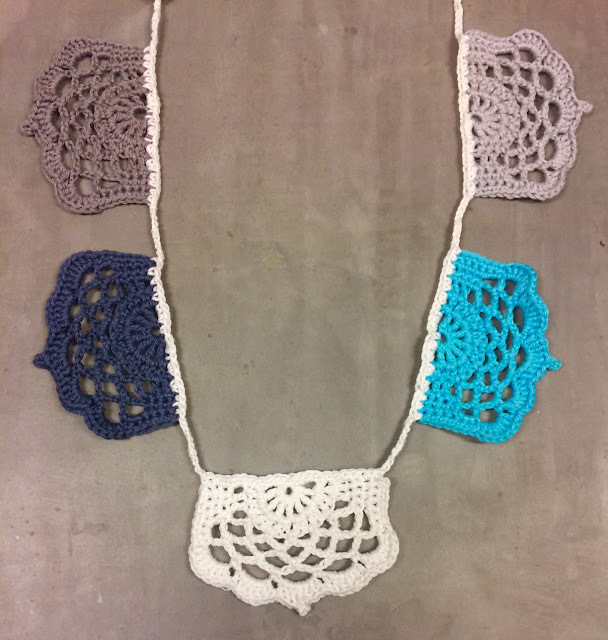 And my Half Lotus Bunting was featured by Creative Jewish Mom! Last week I announced I wanted to make a Thai Peanut Soup. Unfortunately my grocery store didn't have all ingredients and because I'm not the kind of person that loves to shop six different stores to find what I want, I always improvise a bit when I can't find all the stuff I need in one place. Instead of sweet potatoes for example I used normal potatoes. And because no one in my family, except me, likes mushrooms, I skipped them from the recipe. Instead of fresh lime, I used juice from a little bottle. Even though, the soup was delicious! A keeper! 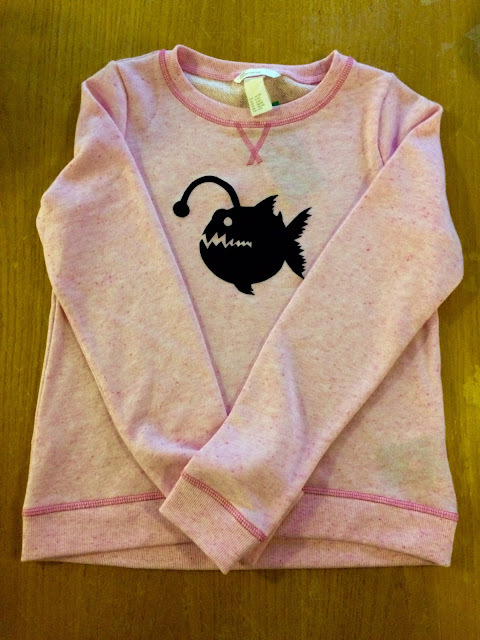 Being into Angler Fishes, of course my daughter wants an Angler Fish Sweater instead of a nice birthday dress for her birthday (I'm afraid the time of nice dresses for her birthday is gone anyway, now that she will be sevenyearsold in a couple of days). But, you wouldn't believe it, Angler Fish Sweaters aren't sold in every shop you can find. Not even in Internet shops. So once again I had to make up something myself. Fortunately my nearby Craft Store sells iron on flock, so I bought a nice sweater and after drawing, cutting and iron on-ing an angler fish, this is what came out. 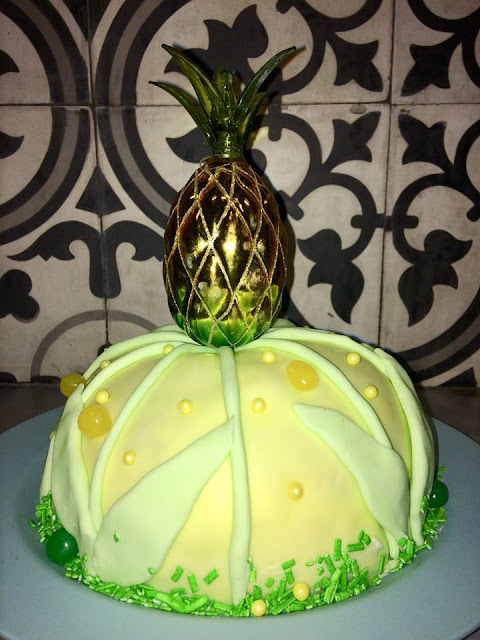 In just two weeks my youngest daughter has her seventh birthday and almost right after Christmas I barely have time to make decorations, a birthday dress or a cake for her, like I do for her sister. Her sister has her birthday in summer, when oceans of time lay ahead to make birthday related things. But I managed to make a garland. 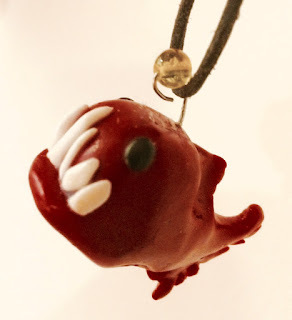 My youngest chose a theme for her birthday, namely the angler fish, but strange enough a garland featuring angler fishes was nowhere to be found. So I made something else. I used this pattern before, but still like it very much. 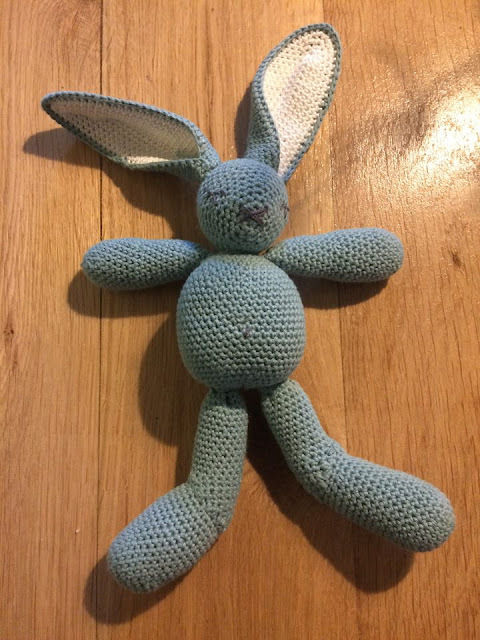 It's easy and fast to make. You can find the pattern here. My Red Velvet Winter Cake (well, not totally mine, because I made it with my daughters of 6 and 9) was featured by Eclectic Red Barn and by Scrapality! Thank you, Mari and Andrea! And my Birthday Party Invitations were featured by Pleasures of the NW and by Sew Can Do! Thank you, Helen and Cheryl! First Made It! of the year. Last week I announced I don't have so much appetite anymore to look for clothes, shoes and accessories to feature in Wanted. After more than four years, I find all the clothes I feature are beginning to look the same, it's all the same style. So I'm more than ready to try something new. I love Pinterest and would like to make one thing that I find on Pinterest every week. Since I have a lot of pins, that I've just pinned and nothing more, I hope this will be a way to reduce the amount of pins on my boards. It can by anything, from cooking to crochet and from sewing to papter crafts. 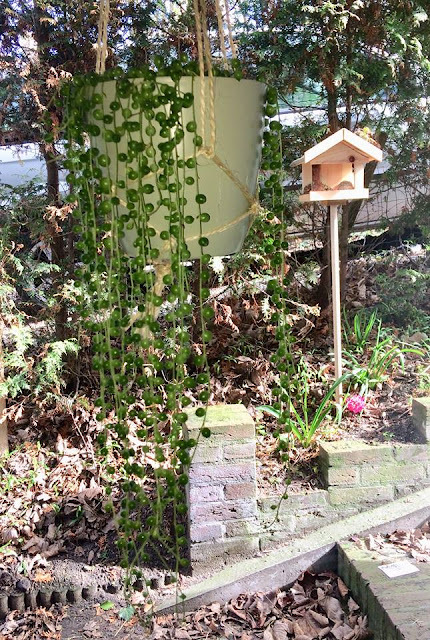 Just small projects that doesn't take weeks to make. Now that the days of parties and celebrations are over, we are going back to business as usual. No more decorations for Christmas, but questions about making Pokemon figures. Never, ever in recent years my daughters said the word Pokemon, but since they got some cards at a birthday party, the cards the owner didn't like, it's what they talk about all day. 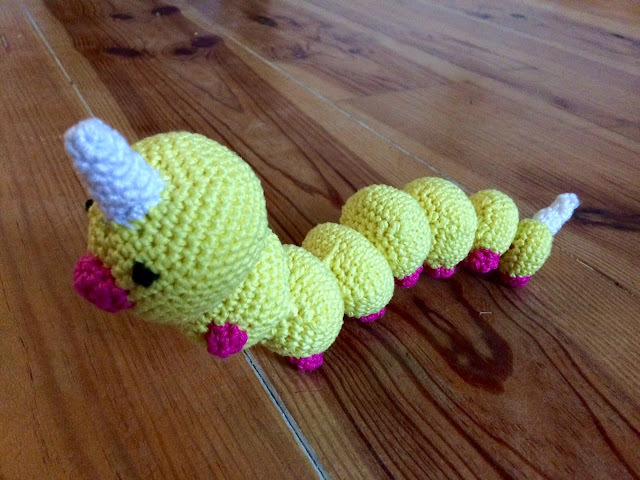 And that's how I found myself making a sort of caterpillar, yellow and pink. According to my daughters its name is Weedle. Just saw my Christmas Candy Cane Hat was featured by Pattern Paradise!